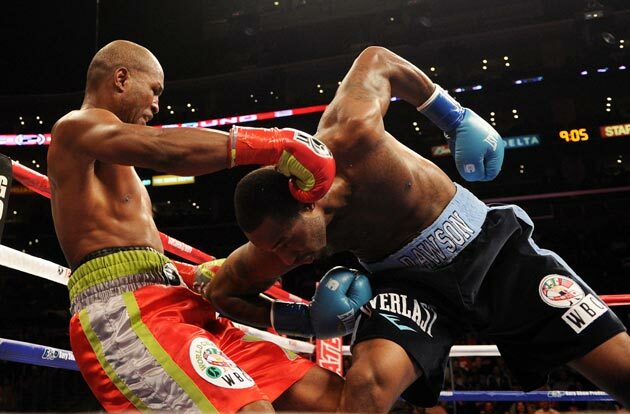 Bernard Hopkins may not be fighting fit for a while, but the WBC has ordered that he and Chad Dawson shall meet in a rematch for the WBC Light Heavyweight title after their controversial fight two months ago in Los Angeles. That night Chad Dawson won by TKO, a highly controversial one. According to Bernard Hopkins, Dawson body slammed him into the floor, injuring the 46 year old’s shoulder. Dawson immediately celebrated his win, with Hopkins unable to continue with one arm. Dawson also didn’t wait a second before announcing he isn’t planning on giving Hopkins a rematch. Bernard Hopkins, upon hearing the news, said he wasn’t planning on giving Chad Dawson a rematch. It didn’t take too long for justice to be done. The California State Athletic Commission ruled the fight a No Contest, meaning Hopkins never lost it and Dawson never won it. The WBC ruled the fight a technical draw, meaning Bernard Hopkins remained the champion. Well the WBC is known for making sometimes hard to explain decision regarding stripping title belts and other tid bits. In their meeting regarding mandatory defenses, Hopkins and Dawson’s names came up. Chad Dawson’s camp seems pretty happy – I think justice has been served. When Hopkins had a draw with Pascal, the WBC gave him an immediate rematch. And now they have done the same thing for Dawson after the controversy. But hold on, there’s an out – A rematch is on the cards unless their representatives mutually agree to another arrangement. So, will there be or won’t there be a rematch? Bernard Hopkins said he’ll try to make it happen – Let’s get the ball rolling. he fans got cheated because of circumstances in the first fight. Now they get an opportunity to get their money’s worth. It’s been a really interesting 48 hours. Things are different now because of that order. Let’s get it on. The bottom line is a champion defends his belt. That’s what champions do. I believe I am the best at light heavyweight. So my whole thing is champions defend, they don’t get stripped, they don’t throw belts away. I’ve done it for 20 years and I ain’t changing my stripes today. So what’s there to stop this fight from happening? As with most things that happen in boxing, money. The first fight was something close to a commercial disaster, something around the 40,000 PPV buys. The sides may find it hard to locate a network that wants to put up big money for the fight. Hopkins earned one million last time, Dawson 800k. His promoters at Golden Boy seem to be thinking otherwise – I think that there is no interest in this fight. As long as the fighters know that, and they are OK with whatever money there is, then why would I want to stop that fight from happening? I really just want to do fights the public would want to see and where I know going into the fight that it will be entertaining. I just don’t think that these two styles mesh.